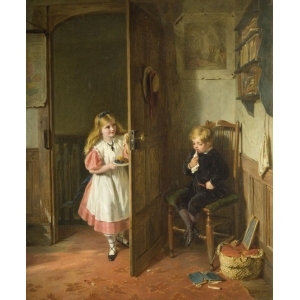 Summary: Oil painting showing a boy sitting on a chair in the corner of a room. He is crying. 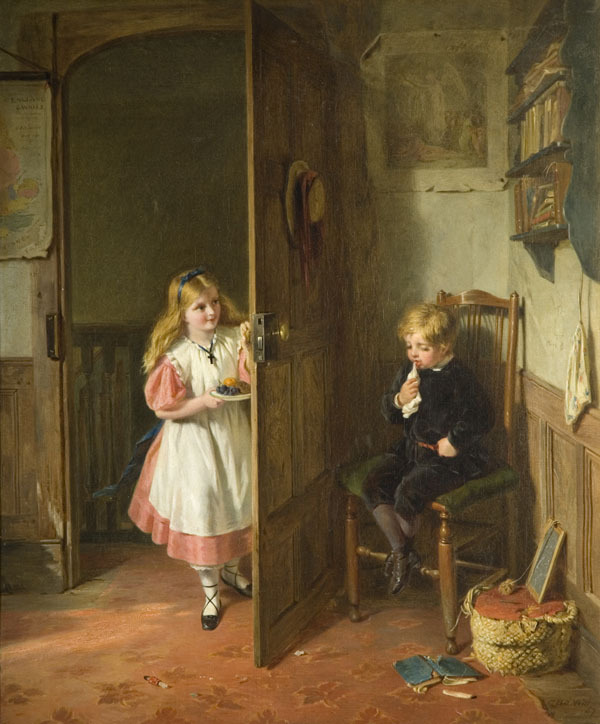 His sister is entering the room bringing him a plate of fruit. Description: Two versions of the painting were made. The first was sold to Graves in 1867 for 170, but was subsequently burnt, presumably at the dealer's premises. The second version was bought by Graves in 1868 for 150 guineas. It is interesting to note that this painting, and also 'The Reproof', both of which we know to be replicas, should be significantly lesser quality than most of the artist's other work. Description: A young boy, sits on the Victorian version of the 'naughty chair'. His schoolwork lies discarded on the floor and is probably the reason why he is in trouble. His sympathetic sister brings him some food to cheer him up. Two versions of this painting were originally made; the first was sold to the art dealer, Graves in 1867 but was burnt, presumably at his premises, the second was bought by Graves in 1868.